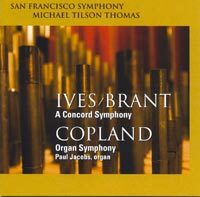 CHARLES IVES (1874-1954)/HENRY BRANT (1913-2008): A Concord Symphony, AARON COPLAND (1900-1990): Organ Symphony. Description: Brant was encouraged by Henry Cowell to orchestrate Ives' Piano Sonata No. 2 and, though he began it in 1958, it took almost 40 years for him to finish it. A live recording with the Concertgebouw Orchestra under Dennis Russell Davies was issued in 2001 (although I and, apparently, many others completely missed it). Brant pointedly avoided the kind of orchestral complexity which made conductors tear their hair out over other Ives works yet he manages to often convey it, for example in the contrasting hymn-like passages and the discordant interruptions of "Hawthorne". This new recording is also live, but made during four performances in February of 2010. Paul Jacobs (organ), San Francisco Symphony; Michael Tilson Thomas. SACD hybrid.